– How can technology drive sustainable business solutions & innovations? Digitalization, big data, AI, VR, blockchain, IoT, GDPR, apps and platforms. Fintech, healthtech and fashiontech. There are so many new tech terms and disruptive business concepts in the air. But what do they mean? And how does all this fit into the sustainability agenda? Throughout the programme we will discuss, network and exchange experience and thoughts on how you can accelerate your own sustainability efforts through the use of technology. Basic Club members: 650 kr. Starts-ups & Students: 250 kr. 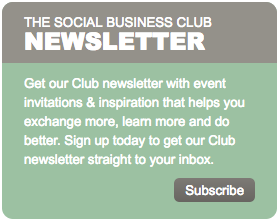 Not yet a member of The Social Business Club? Read more below. The Social Business Club is an inspirational network forum for professionals from around the world with an interest in innovative and sustainable business practices that create value for society and the bottom line – from CSR and social entrepreneurship to social innovation and shared value. Basic membership is free and gives you access to our online network of more than 2,700 like-minded members from all over the world.